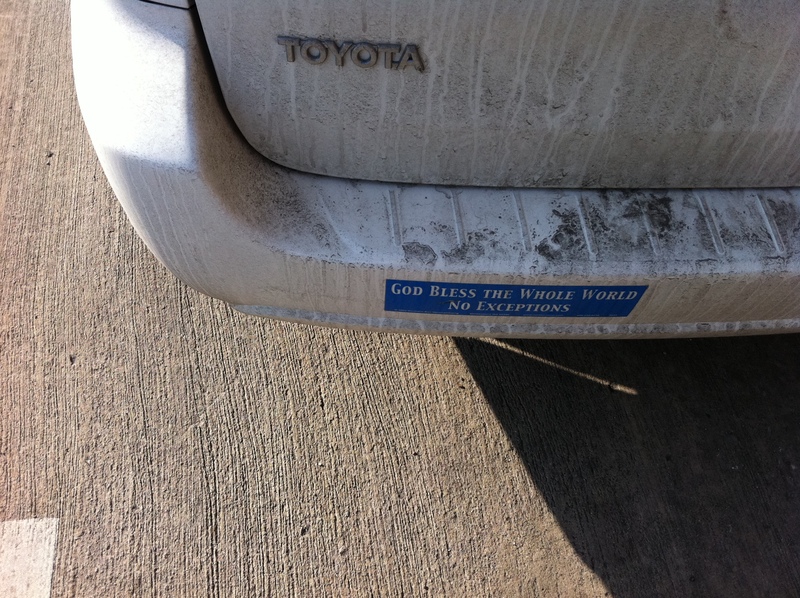 Possibly the best bumper sticker ever. Probably the driver of this car should take over the writing of this blog. And get a car wash.
After mass we walked over to our local shoe store to replace the shredded, too-small sandals pinching the feet of our three children. Our youngest found sandals, our son found sandals, even Sam found sandals, but our tween, alas, did not. There were a couple of outré pairs that she tried on, but she made the shocking discovery that the gladiator sandals were uncomfortable…all those straps! And the other pair had buckles and zips and all sorts of bells and whistles that would make them pretty inconvenient for running around outside all summer long, flipping them off at the beach for wading, flipping them on again for the sandy walk home. Disappointed that everyone else had found something, Riley talked me into walking over to the mall to see what we could find there, but it was the same story. Flip-flops, which I won’t buy for her, despite living in them myself, (“Do as I say, not as I do! It’s too late for my hopeless feet, cherish yours!”) sandals with heels, nothing that was cute and comfortable at the same time. Nothing that you could play an impromptu game of baseball in. Nothing you could wear both to church and to the park. Nothing any good for a normal, active nine year old girl who has become ever-so-slightly picky about what she wears. I may or may not have stopped my daughter dead in her tracks for a lecture right there in the middle of the mall. I wish I could tell you that right at the culmination of my speech, as the music was reaching its zenith, the clouds parted, the sun shone down and the Lord’s voice spoke, “these are my beloved sandals with which I am well-pleased. Buy them!” and we walked home poorer but happier, but that didn’t happen. We couldn’t find a single solitary ever-loving thing. So Riley wore her ratty old sandals to play in all afternoon, and I found a couple of good options on Zappos. We’ll give them the baseball test when they arrive later this week. We don’t have any solid plans for our next week. The hubs has oodles of vacation time banked up but is too busy to use it, so there goes our brief flirtation with a last-minute trip to the land of the Mouse and all his merchandise, aka Disney. I’ll maybe take a day trip or two with another family we’re close to, (water park? big city museums?) but I don’t have any firm plans yet. Here’s my plan. Tomorrow we’re going to go to an outdoor Stations of the Cross that is nearby, and then Friday kind of takes care of itself, with that big old service right in the middle of the day. I don’t know, it just sort of seems like the least we can do.